It’s nearly ten years since I’ve visited the Cape winelands of South Africa, but the images are still clear in my mind, for this part of the world is right up there on the list of most beautiful wine regions. What’s more, even ten years ago, it was clear that the South African wine industry was getting wine tourism right. Back then, touring around in the surroundings of the dramatic mountains, combined with the distinctive Cape Dutch architecture, I could see old wineries re-building, architect-designed wineries emerging, winery restaurants appearing; Cape Town had well-stocked wine shops that offered shipping back home; and most importantly of all, the wine producers were generous with both their time and their ever-improving wines, wanting the world to learn about and experience the best they had to offer. Since then, wine tourism has gone from strength to strength. As we saw from the recent football World Cup, South Africa is well geared up for tourism, and the country’s main vineyard areas are all in easy reach (20 minutes to two hours) of Cape Town, which is a keen member of Great Wine Capitals. One of the most amazing ‘complaints’ I read about the World Cup was that some visitors were disappointed by cool and rainy weather, having not taken into account that this was winter and South Africa is not equatorial! The very fact that the Cape in particular has cooling winds coming in from the Indian and Atlantic oceans is a key to why they produce some excellent wines. Combine this with a wide range of suitable vine-growing soils, micro-climates influenced by the surrounding mountains and an expertise in matching grape variety with terroir that has developed greatly in the past 20 years, and the potential is huge. South Africa has had designated wine routes for many years, and by far the largest in terms of winery membership is Stellenbosch, which is also the oldest, dating back to 1971. Stellenbosch is the name, not just of a well-known University town, one of the earliest towns to have been settled in South Africa, but also of the country’s best known wine region. Today for tourism purposes, Stellenbosch is divided up into five wine routes, sensibly not by appellation, but by routes that are logical for wine tourists to follow. (Something dear to my heart, as we’ve taken that brave step with the way we divide many of the French wine regions on Wine Travel Guides). Over 140 wineries are part of the Stellenbosch American Express® Wine Routes programme, gaining both in public relations terms and in cellar door sales. The programme also helps encourage visitors to indulge in other attractions wineries offer, such as restaurants, specialist non-wine products (e.g. cheese or olive oil) or complementary activities (e.g. bird watching, fly-fishing). Nearly all the wineries charge a small amount for tastings, reimbursed on purchase and they will organise shipping overseas. Gardens alongside the vineyards are gaining in popularity to support the wine industry’s laudable initiative to set aside more areas as non-planting land for vineyards, encouraging South Africa’s natural biodiversity. In this area known as the Cape Floral Kingdom, the emphasis is on planting only native species and encouraging the re-introduction of local fauna and flora. The best time of year to visit the South African winelands is between November and May, with spring (November) and Autumn (April/May) being not only the cheapest time to travel but also the most interesting times to see the vineyards and wineries too. If, however, you do like the idea of wine touring during the Northern Hemisphere’s main summer holiday period of July/August, don’t worry, the wineries keep their doors wide open, and what’s more Stellenbosch holds a huge, annual 4-day festival normally towards the end of July. In 2010, it was brought forward to early July to coincide with the World Cup and to attract international tourists. Instead of being held in the town, it became a travelling festival, with shuttle buses taking visitors between 60 wineries. 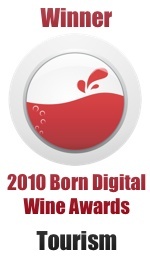 Next year this great wine event will once again be held in one venue in the town from 28 – 31 July 2011. As with all travel, advance planning can make all the difference and there are excellent resources available to research your trip both on-line and in print. Do check out Wines of South Africa’s very informative website, and also the Stellenbosch Wine Routes own website, which is very comprehensive and easy to navigate. Thanks are due to these last organisation for the photos on this post. When I travelled a decade ago in South Africa, I was always armed with the latest annual edition of John Platter South African Wine Guide, although the book has always been notoriously difficult to find until you’re out there. It remains an excellent guide to wines and wineries and has some decent wine touring information too. More detailed information for wine tourists travelling all over the Cape wine regions can be found in The Essential Guide to South African Wines 2nd edition by Elmari Swart and Izak Smit, published in 2009. Attractively laid out, the heart of the book divides the wine regions into ‘Pockets’ according to their terroir, again another way of splitting up regions in a logical way for visitors, not necessarily by appellation. Wineries include most of the well known names, although the publication sought sponsorship from these to help with costs. A few pointers to local restaurants and accommodation are included. There are clear maps and in an innovative move, GPS information can be downloaded to your SatNav from the publisher’s website. The book includes useful and well-written introductory background chapters about the history, climate, geology, grapes and wine styles, plus some good basics on wine tasting and what to expect when wine touring in South Africa. At least if you plan your wine tour in the beautiful wine country of South Africa next year, you are more likely to hear the sound of exotic bird song than of vuvuzelas. This entry was posted on Wednesday, July 28th, 2010 at 2:43 pm and is filed under Vineyard Visits, Wine Tourism General. You can follow any responses to this entry through the RSS 2.0 feed. Both comments and pings are currently closed. I look forward to visiting South Africa, especially when my appetite is whetted by your post! So I imagine they will revert to the usual format next year. Thanks, Brett. Yes, I must go back soon too! According to Stellenbosch Wine Routes the issue this year with the festival was that the locals (who are usually the main visitors) stayed away due to the World Cup. Next year will indeed be back in the old format, but they are considering doing a 2nd festival in their summer months that might have the shuttle format as this is particularly appropriate for international tourists. Dear Brett, we look forward to welcoming you to our beautiful country. Please do let me know when you are planning to be in South Africa, we would love to introduce you to some stunning wines and friendly locals. And enjoy the Essential Guide!! Best regards. This has to be one of the most helpful/useful posts I’ve seen on South African wine tourism! Thanks for such useful information, it’s a great starting point because we’re seriously considering a trip to South Africa. Do you have an personal favorite wineries to visit? Thanks, Katie. As I wrote, it’s 10 years since I’ve been there, but have very happy memories of visits in Stellenbosch to Kanonkop and Stellenzicht, in Paarl to the wonderful Fairview (also for their goats cheese), in gorgeous Constantia to Klein Constantia and so, so many more. Happy planning. Now I’m getting very excited! Thanks so much.